How Can I Make Sure My Wedding Photos are Safe?! My mom used to always say "if our house was burning down, the one thing I would make sure to grab (of course, after the kids!) would be my wedding album." Lucky for those of us who tied the knot in the digital age, most of the time our photos are backed up on a cloud, or even to social media pages, allowing memories to live on even after disaster strikes. But I think there's something to be said about my mom's sentiment, and the importance of printed photos. Those photos in her wedding album tell the story of the beginning of her life with my dad, and of our lives as a family. They're precious, and priceless. They are the family legacy - an heirloom that, God willing, will be handed down generation after generation so everyone can see where, and how, it all started. So, as a bride, what's the best way to go about making sure YOUR wedding images are safe? Below are a few tips for backing up your precious memories that will ensure - no matter what happens - that you will have them for years to come! 1. Invest in a professional wedding album. I know what you're thinking: but they're so expensive! Trust me, I was a bride not too long ago and I can completely understand hesitancy based on price when it comes to professional wedding albums! Wedding albums are not only expensive for brides to invest in, but are also pricey for photographers to order, due to the high-quality materials used. A professional album will have thick, professional archival photo paper with the highest quality leather or linen, built to last for years to come. Some even go the extra mile to include a high quality storage box to keep it even safer! A wedding album is not only another great way to "back up" your wedding photos, but is a physical heirloom to pass down from generation to generation. That CD or USB drive you have might be great for making prints, but are you sure you'll be able to show your kids and grandkids your photos in 10, 20, or even 50 years? Technology will be much further then - you never know if those storage devices will even be around! 2. Store your photos on a cloud server. 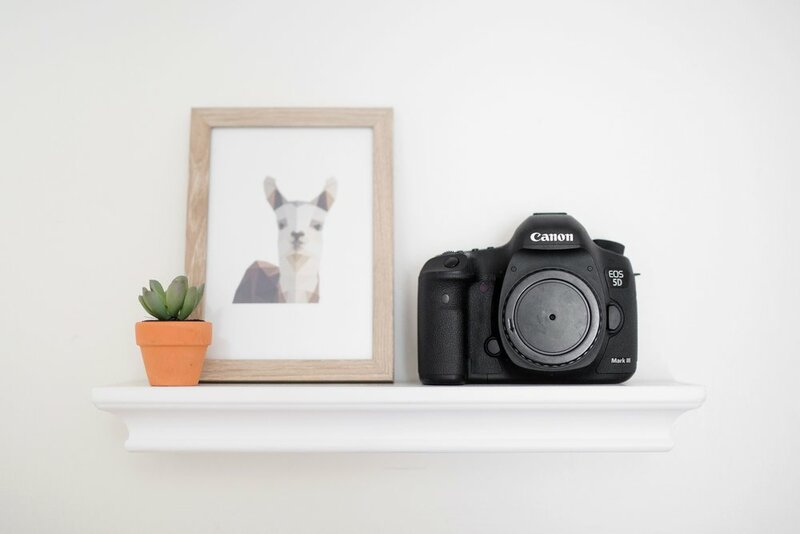 With so many options for cloud storage nowadays, it's easier than ever to make sure your photos are somewhere safe outside of your home, in the case of fire, flood, or damage. A few of my favorites for online storage are: Dropbox, Google Drive, and Carbonite. 3. Spread the love to parents, grandparents, and other family members! What do I mean by this? Well, in addition to investing in an album for yourself, consider investing in an album for your parents, your spouse's parents, and even your grandparents! Not only do albums (or coffee table books!) make nice gifts, but in the case of a fire or flood (God forbid!) your wedding photos are safe somewhere else. Plus - albums and coffee table books make great (and easy!) Christmas and birthday gifts after your wedding day! 4. Check to see how long your photographer keeps your wedding photos. Some photographers keep all of the photos from your wedding day long after the event (I fall into this camp!) and some toss them after the event is over. Check with your wedding photographer to see how long they hold onto your digital files, and even ask how they back them up. Personally, I back up every wedding to two external hard drives, an online gallery system, and a cloud storage backup - mainly because I would want someone to do the same for me! 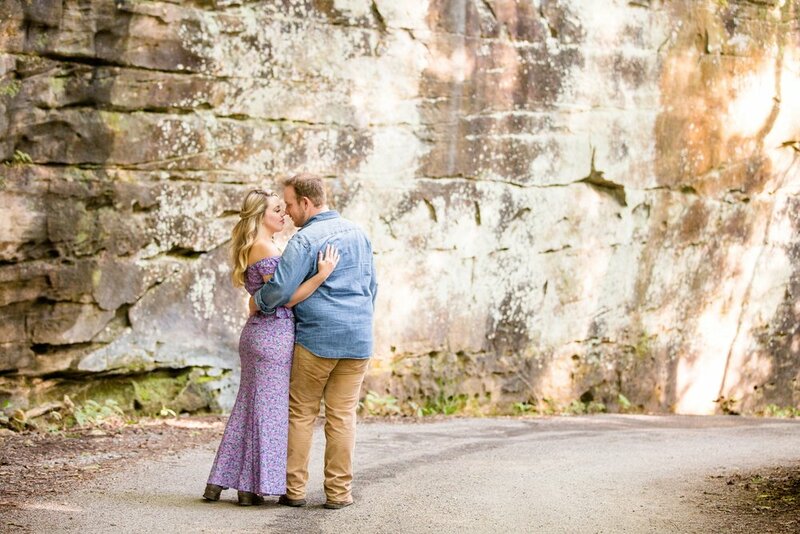 If you are interested in creating a wedding album, shoot me a message or send me an email at jhidingerphotography@gmail.com to learn more about the albums we offer! One of the most frequently asked questions I receive from fellow photographers (or those looking to get into photography) is “what’s in your bag?” I decided to finally write a series of blog posts detailing the current gear that I use because, when I was starting out, I knew how much it helped to know what gear those in the field found useful, because, let’s be honest – there is SO MUCH gear out there. How are you supposed to know what will work best for YOU and the type of photos you love to shoot? So if you just so happen to be interested in the tools I use to create photos, you are in luck! Last but not least in the "What's in my Bag" series are my favorite random accessories! This has become my new favorite accessory that I take with me everywhere! A white balance filter allows you to easily set a custom white balance for any lighting scenario – for example, in a church with mixed lighting, etc. It has saved me from some pretty ugly lighting many a time this year! I cannot go to any shoot or wedding without my little pop-up reflector! I find such a HUGE difference in my work, especially for senior portraits, when I use a reflector! It just adds that extra “pop” to images by bouncing light into people’s eyes. I would go as far as to say that consistently using a reflector has been the biggest game changer in my work. I love this reflector in particular because it has a handle, so I can use it on my own if need be! Call me crazy, but I love my reflectors so much that I invested in TWO! I love having a larger reflector because, as you may be able to deduce, it reflects more light – I can easily use it for couples, bridal parties, or full-body senior shots. I typically need an assistant to help me with this one, though, which is the only downside! So if you just so happen to be interested in the tools I use to create photos, you are in luck! Second up in the "What's in my Bag" series are my favorite lighting tools and modifiers! These are probably some of the least expensive lighting products on the market, but I LOVE them. These Yongnuo speedlights and transceivers are SUPER easy to use, and have always been very reliable in terms of firing (for me). I usually have to replace these every one to two years, but they are so cheap that I don’t even mind!! 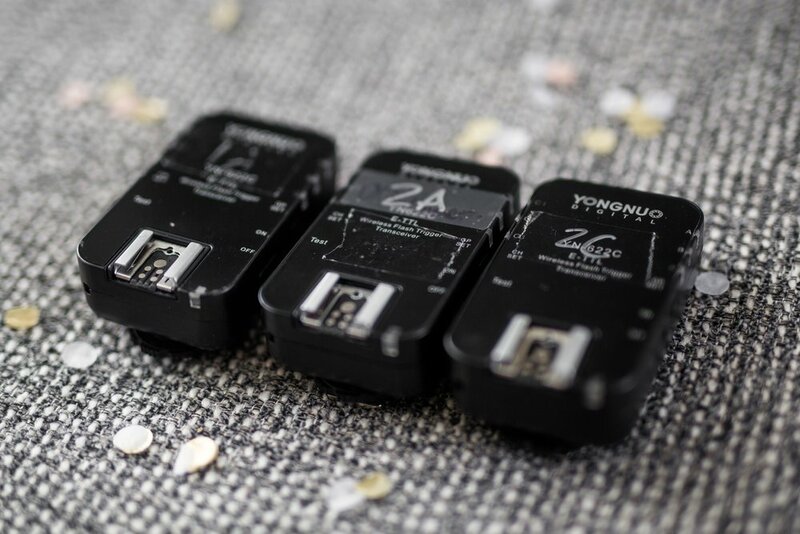 These transceivers are inexpensive and work with the above speedlights! I love these white shoot through umbrellas for clean, evenly spread light, and typically use one or two of these with speedlights for family formals at weddings! In addition to having a few shoot through umbrellas, I love having at least one softbox I can bust out if need be! This softbox is incredibly easy to set up and is perfect for photographing portable, on the go sessions and events. In contrast to umbrellas, softboxes provide more concentrated light. I love using this one in particular for couples or individuals! These air cushioned light stands are my favorite for lighting receptions and dance floors! Their height allows me to place speedlights high above guest heads for less disruption during reception activities. So if you just so happen to be interested in the tools I use to create photos, you are in luck! First up in the "What's in my Bag" series are my favorite cameras and lenses! Why two, you might ask? When photographing weddings, I like to make sure I have one fully functioning camera, and one back up (just in case!) - you never know what can happen, and I would hate to be left without a camera on the biggest day of someone's life! This is most certainly one of my favorite lenses. I often use this lens for couples and families because of the compression (here is a great article about compression, for those of you who are interested!). I also love to hand this lens off to my second shooter to grab super tight close ups of couples and bridal parties while I am getting the main “safe” shot! This lens is by FAR my favorite lens for photographing seniors. I love the low aperture (more about that here! ), which lets me create an almost dreamy-like backdrop! I also love using this lens for couples when I want to get super close up! These are my standard go-to lenses many a time for getting in large backdrops (buildings, church ceremonies, etc. ), as well as for tight spaces, like getting ready photos for wedding days in small hotel rooms! I also love using my 35mm for detail photos (wedding invitations, usually!) on wedding days! In my bag, this lens really has one sole purpose: the ring shot! For wedding days and engagement sessions, I always love to have my 100mm on me to ensure I can get an epic ring shot! I also love having this lens, because it has a similar compression style to the Canon 70-200, so it can act as a backup if need be for that specific lens! Can I be a Wedding Photographer if I'm an Introvert? When I was in middle school, I didn’t have many friends. It’s not because I didn’t want to have any friends – I was just painfully shy. I could barely look people in the eye, let alone hold a conversation with them, no matter what age of whoever I was “holding” a conversation with. Because I have natural tendencies towards introversion, I used to limit myself – a LOT. I told myself I couldn’t be a leader, and that I could never EVER do things where the attention was solely on me. I specifically remember telling myself that there was no way I could EVER own a business, because who would want to work with an introvert? People LOVE extroverts and their big personalities – why would someone choose to work with me if they could work with them? But that’s the funny thing about life. Sometimes what we perceive as a weakness can actually be a strength. Towards the end of my high school years, I started challenging myself to simply just love on people – THAT is something I could do, regardless of the personality type I had. I realized that my introverted-ness couldn’t be an excuse for not having any friends, or not getting where I wanted to be in life – so I started simply finding ways to love on and listen to the people around me. 1. Ask a LOT of questions – good ones. Upon first meeting me, some people mistake me for an extrovert. Sometimes, my introverted tendencies are disguised by my love for asking questions. It’s SO easy to keep a conversation going, even if small talk isn’t your “thing,” by asking questions. But the catch is – they have to be genuine, and they have to require more than“yes” or “no” response. And at a wedding, there are so many friends and family members of the couple coming together that there is always a plethora of good questions to ask! When you ask a question, make sure to listen to the response. This may sound quite obvious, but you’d be surprised at how many people forget to listen to the answer to the question they just asked, simply because they’re trying to think of the next question or how they’re going to respond. Asking a follow up question or clarifying a point from what the other person said is a great way to keep the conversation going and make sure you’re listening! 3. Don’t hold back on dishing out compliments – but make sure they’re genuine. This is one of my favorite strategies for making people feel comfortable when I’m taking their photo. Compliment the CRAP out of them! I love having the opportunity to encourage people, and, believe it or not, being in front of the camera can sometimes make even the most confident folks clam up a little bit. By genuinely complimenting whoever’s in front of your camera, you will automatically boost their self-esteem. But again – make sure your compliments are genuine, because we all know what it’s like to receive a compliment that isn’t really genuine! Keep it real by pointing out something specific, like: “I love the pattern on your dress!” or “your hair color looks perfect against this backdrop!” or “the way you just naturally tucked your hair behind your ear was perfect! Would you mind doing that again?” Anything that can build the confidence of the person in front of your camera is a great way to go! 4. Take the time you need to recharge. Introverts tend to recharge their batteries (or refill their bucket) by having alone time, so make sure you get the alone time you need after a wedding or portrait session! This might mean unwinding by watching a movie, Netflix series, reading a book, or taking a nap. I personally love to come home and edit a few sneak peeks while I watch a show (usually the Goldbergs or How I Met Your Mother!). If you’re an introvert chasing a dream, limiting yourself like I was – I challenge you to try putting each of these three tips into action to see if they make a difference for you! And as always, share any tips you might have in the comments below – you never know who needs to know what you have to say!